Well we once had a cow (that jumped over the moon) called Big Jack, but this is about Little Jack. Although I have less and less time over the years to indulge in my love of celtic history and mythology, I always find a little bit of time at this time of year to celebrate an ancient celtic tradition even in a small way. In the northern hemisphere where the Celts lived this time of year is Samhain, or the beginning of winter and was celebrated on 1st November. What we know today as Halloween is believed to originate from Samhain festivities, but as we are in the southern hemisphere it doesn’t make sense to celebrate the start of winter when it is actually finishing. So for us, the first of November marks the arrival of summer and so the Celtic festival of Beltaine (meaning “bright fire”) is more appropriate. (In the the northern hemisphere Beltaine falls in May, hene the May Day festivals). At Beltaine, the Celts lit the last bonfires of the winter and would have moved their livestock into summer paddocks – which is something we did a few weeks ago – so even in our amateur hobby farmer ways, we mark the summer and recognise the changes it brings to the land and our animals. Ironic that the festival means ‘bright fire’ given that we also prepare our properties and houses for the start of the bushfire season here. 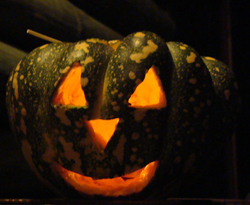 Beltaine is also associated with my favourite celtic symbol, the green man or Jack-in-the-Green and Halloween is known for that other jack the jack-o-lantern. 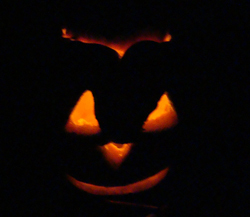 So, at this time of year which we know as Halloween/Beltaine, I like to carve a little pumpkin as my own little last bonfire of the season to mark Beltaine and the start of summer. It’s also a great excuse to make some tasty pumpkin risotto! This is by no means my best pumpkin carving, but Fionna sweetly gave me some free time this evening while she napped, and I allowed myself a whole half hour to carve the pumpkin and get the risotto cooking! This was speed carving. Then a wee bit later I managed to light the lantern and get it outside by the front door *just* as it went dark. Phew!